This Brand new Vacation Rental is now available! Newly remodeled and furnished with the ocean in mind. 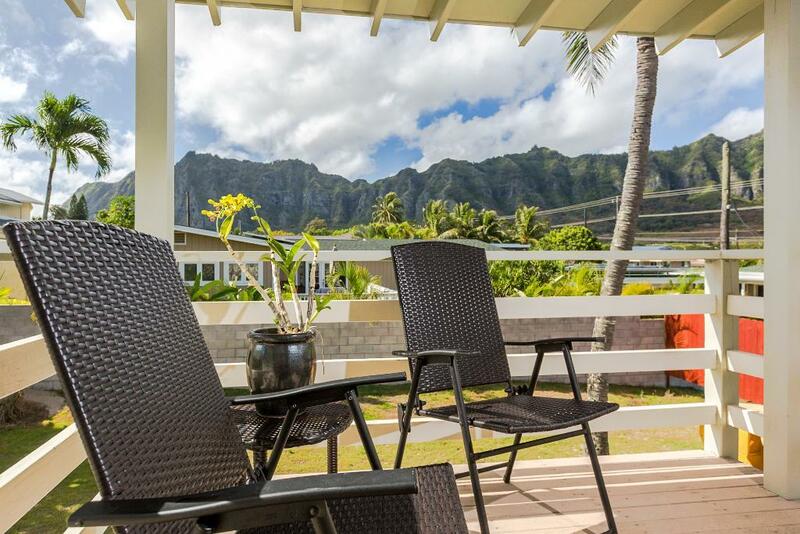 Come and enjoy your morning coffee and breakfast sitting on the deck with the picturesque views of the Koolau Range. The beach is just a little walk down the street to the beach access or for a short drive you can be at the famous Sandy's Beach or Hanauma Bay. The studio boasts a serene atmosphere with the comforts of home. A fully equip kitchen for your pleasure. for a get-a-way is here. $150 - $250 per night. 40% down to hold a reservation. Balance due 60 days before check-in. $200.00 security deposit. $125.00 cleaning fee. 4% processing fee. Listed rates do not include tax. Holiday and peak season rates and required length of stay may be different than quoted above. Credit cards, cash, checks and wire transfers accepted. Minimum night stay varies amongst the various rental units. Many rentals have 30-night minimums. Tax number: TA-169-133-6740-01. Very comfortable and clean room. The breeze on the top floor was very pleasant. Thank you very much. We had a wonderful time! Sea Suite was lovely. It's the perfect size for 2 people... cozy, but not at all crowded. The unit & grounds were very clean & well maintained. Location was exactly what we were looking for, quiet & relaxing & just a few min walk to beautiful Waimanalo beach. We were extremely satisfied & will definitely recommend the rental &/or visit again ourselves if the opportunity arises. Thank you for a lovely stay! Oh & also, thanks so much for the quick response when I was unable to find the email with entry instructions/code! Mahalo! The sea suite is a very nice place, well equipt for a stay in Hawaii! We had a good time and the service was great. Questions answered in a most timely manner! We would stay there again if we are in the area. The overall quality of the "Sea Suite" was excellent. Housekeeping had just finished cleaning up and I was able to check in 1 hour early! The condition and cleanliness of the suite was very good. We had a welcome basket filled with wine, macadamia nut candy, and other local goodies. There was a nice kitchen and we were able to shop at the local market for food. We used the nice Weber gas barbeque to grill salmon and corn on the cob. It was beautiful to sit on the balcony porch and look at the surrounding pali (cliffs). The beach is very close by and we walked there on two days to swim. Also included in the rental were boogie boards, snorkeling masks, and folding chairs. There is also a nice washer and dryer in case you want to wash your clothes. I would definitely recommend the "Sea Suite" to friends. We had a nice time and enjoyed the Sea Suite. We would it again. We loved our stay at the Sea Suite! The Suite is in excellent condition. They had everything we needed and more. We used their beach towels and boogie boards a lot, as the beach is just a block away. This was the quietest beach we swam at and with just as much beauty as any other we found on the island. Would highly recommend to anyone especially those looking to get away from the crowds of Waikiki. The only reason we gave it four stars is simply because there are two dogs on the property behind the house that would bark real loud a couple times a night. That however was the only drawback to our stay. The property manager was always available for any question or help. We stayed in the suite a week! The location was hard to find and the driveway and yard set up was a little funky! The Suite was great, it was a great studio spacious and nicely appointed! The kitchen had all the basics and we found lots of extras: baggies, foil, salt, pepper, garbage bags, soap, coffee filters, etc! The deck was perfect for morning coffee and drying towels and swim wear! We would stay there again! So the welcome email didn't actually have the correct key-code for the lockbox and we had to call to look it up. It was also rather difficult to find the house because it was just a driveway between two houses, plus the address was 41-895A rather than 41-895. I think it might have been easier if that was listed too because the yellow sign out front was for 41-895A. Apparently things have changed since the Google maps picture was taken: http://goo.gl/maps/zGscs There is now a long driveway where the palm trees used to be. Other than that, the place was great. Thanks.